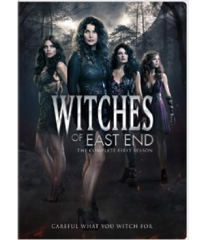 Witches Of East End: The Complete First Season DVD Giveaway! Fine Print: I was given a copy of the DVD for review and Twentieth Century Fox is giving another to a reader. All opinions and statements below are my own. I first heard about Witches of East End when I read about it in a magazine last year. I’ve been a fan of Jenna Dewan-Tatum’s dancing, so her name caught my eye. Then seeing that Julia Ormond was also in it (“Sabrina” anyone?? ), I looked it up online. That was when I was struck with the photo above and sold. I don’t know what it is about that image, but the designer did a good job! I check and re-check the nuances whenever I see it! Witches of East End is a lot of fun. It is a little magic, a little soap opera, a little “Charmed” and a little “Revenge” all mixed together. You can call it a guilty pleasure, but you’re going to keep on watching! The actresses have a fun chemistry and the storyline is intriguing. They give you just enough in each episode so that you find yourself going, “Okay…. just one more episode!” when you know that bedtime has long come and gone. If you enjoy television candy, this is right up there! To get everyone excited about a new magical world, I am giving one lucky winner a copy of the Witches Of East End Complete First Season! To enter this giveaway, complete any or all of the options listed below. Giveaway ends 7/9. Good luck! I would say Scandal is my favorite guilty pleasure show right now. I am the last one to hear about shows on TV and have to catch up on Netflix! Right now I am about to embark on American Horror Story: Coven! Botched is my favorite guilty pleasure right now. At the moment – Scandal. I like to watch True Blood. My favorite guilty pleasure TV show is Orange is the New Black. The Walking Dead is my fave tv series. I have lots of them — right now I’m watching Six Feet Under. I just finished True Blood. My newest two guilty pleasures are Orange is the New Black and Breaking Bad. Been wanting to watch this since it first came out. I was a diehard fan of “Charmed” so this show seemed to be the next step. My favorite would have to be “Castle”. I like to watch comedy’s like Big Bang Theory, Modern Family, and The Middle! My guilty tv pleasure is Naked and Afraid. My favorite guilty pleasure show is Mistresses. I love it! My favorite guilty pleasure show is Big Brother. My favorite guilty pleasure is Keeping up with the Kardashians. I would love to try this show! I like to watch So You Think You Can Dance.